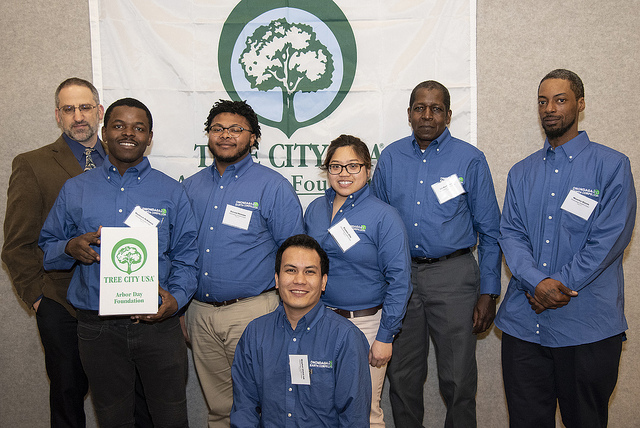 On March 21 in Albany, NYSDEC and community leaders celebrated the commitment of NYS Tree Cities, Tree Line Utilities, and Tree Campuses to our collective urban and community forest. Six New York communities became Tree Cities USA for the first time in 2018: Canton, Lakewood, Middletown, Niskayuna, Orangetown, and Sackets Harbor. To learn more about becoming a Tree City USA, Tree Line USA, or Tree Campus USA, see the Arbor Day Foundation website. The ceremony also honored the winner of the 2019 Arbor Day poster contest. From SUNY New Paltz News: SUNY New Paltz has joined a select group of U.S. colleges and universities that have met campus environment standards established by the Arbor Day Foundation, the nation’s largest nonprofit membership organization dedicated to planting trees. “Earning Tree Campus USA status demonstrates to the world what those of us who live and work at SUNY New Paltz already know – that we have an extraordinary environment for studying ecology, not only off-campus but on campus as well,” said Eric Keeling, assistant professor of biology. Keuka College Grounds Manager Drew Rojek proudly accepts recognition for Keuka’s first year as a Tree City USA. Drew Rojek has been the Keuka College Grounds Manager for just over a year. With Rojek’s leadership, the College recently celebrated its first year as a Tree Campus USA, one of just 22 in the state of New York. Originally from Buffalo, Rojek lives in Canandaigua with his wife Dana and two daughters—Ava, 4, and Lainey, 18 months. Drew and his wife Dana live in Canandaigua with their two kids. Rojek received his BS in Biology from Gannon University in Erie, PA, and his Master of Landscape Architecture from Morgan State University (MSU) in Baltimore, MD. While pursuing the latter, he worked on the grounds department of MSU and after graduation worked for a design-build company as an LA doing mostly residential design work. Celebrating Beacon’s 20th year as a Tree City USA! (from left) NYSDEC Urban Forestry Program Assistant Mary Martin, City of Beacon Highway Superintendent Reuben Simmons Jr., DEC Region 3 Senior Forester George Profous, and NYSDEC Urban Forestry Partnerships Coordinator Sally Kellogg. For the NYS urban and community forestry community, the annual Tree City/Tree Campus/Tree Line USA awards ceremony is always something delightful to look forward to in the last throes of winter. 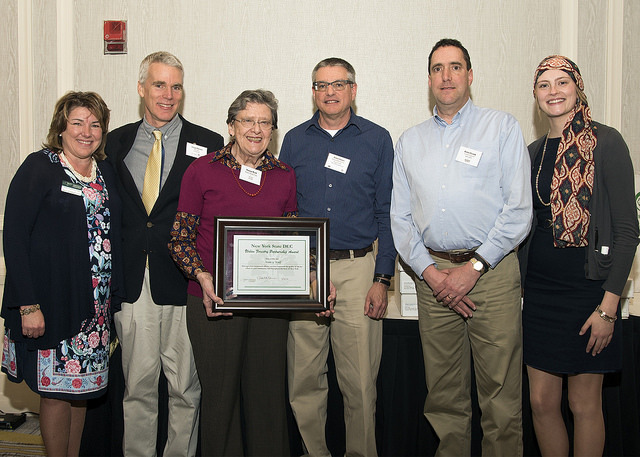 In 2017 it was held on March 30 in Albany and honored 115 Tree Cities statewide, 22 Tree Campuses, and 5 Tree Line Utilities. More than 130 people from all 9 DEC regions attended, making it the most attended awards celebration yet. Thank you to NYSDEC Urban Forestry Partnerships Coordinator Sally Kellogg for her help with this pictorial of highlights from the event. NYSUFC Founder Nancy Wolf received an Urban Forestry Award in honor of her many contributions to our field. Current NYS Urban and Community Forestry Program Coordinator Mary Kramarchyk (left) was joined by two former Program Coordinators–Peter Innes and Peter Frank (to Nancy’s left)–who turned out to support their colleague and friend Nancy and by DEC Forester Greg Owen (second from left), with Program Assistant Sally Kellogg at right. Congrats, Nancy! Hosted by NYS DEC, the 11th annual Tree City/Line/Campus USA Recognition Ceremony was held on March 30, 2016 in Albany. These programs were created by the Arbor Day Foundation and the National Association of State Foresters to recognize the stewardship of urban forests by communities. New York State has 108 Tree City USAs, 6 Tree Line USA utilities, and 18 Tree Campus USAs. A complete list of all New York Tree City USA and Tree Campus communities is posted on DEC’s website at http://www.dec.ny.gov/lands/4957.html. This was New York’s biggest ceremony yet, with communities from all of the nine DEC regions attending. One of the highlights was when NYSUFC founder Nancy Wolf was recognized with an Urban Forestry Award for being so pivotal in starting the urban forestry movement in our State. Rebecca Hargrave: Get to Know Her! 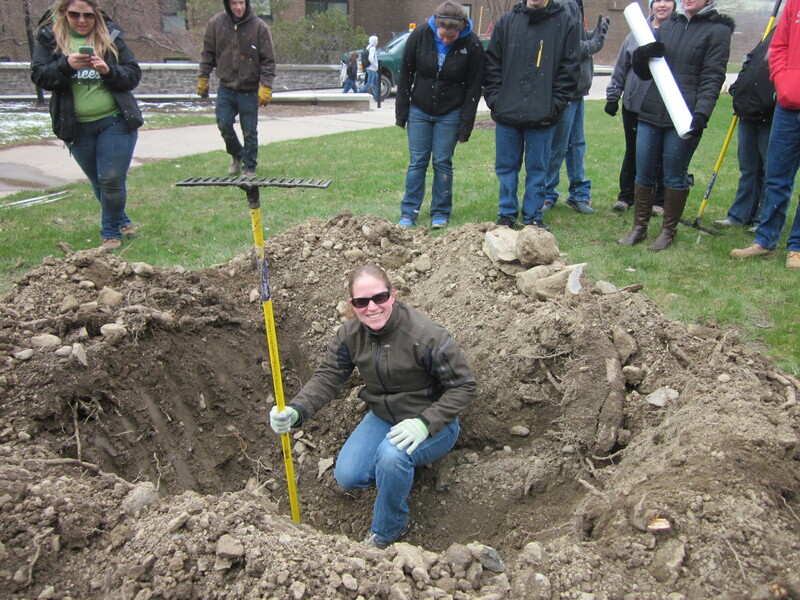 Rebecca measuring planting depth for a scarlet oak on the Morrisville State College campus on Arbor Day, 2014. Please tell us about your educational and career trajectories. Rebecca Hargrave: I went to Penn State for forest science. I don’t think I really knew what I was getting into when I enrolled, but I loved it. After my sophomore year, I spent the summer doing forest inventory in Montana for the Forest Service. I really enjoyed the job, but it was too quiet—not enough interaction with other people. At that point I had been exposed to urban forestry, so when I got back to college that fall, I switched into the new urban forestry concentration at Penn State. The following summer I worked for the Borough of State College, PA on their tree crew, planting and pruning trees and conducting inventories. That cemented my decision to pursue urban forestry.